When I moved to Vietnam in October 2012, I went through LanguageCorps to obtain my TESOL (Teaching English to Speakers of Other Languages) certification. The program started in Cambodia and for two weeks, I learned about crafting lessons and picked up classroom management skills. Then, I packed up and traveled to Ho Chi Minh City where I completed the program by doing two weeks of teaching practice. One month later, I got my first job at a language center teaching learners of all ages from four to forty. I, then, got my second job teaching Japanese elementary school students at the Japanese School. My friend, Tucker, who managed the program in Cambodia, asked me to write a list of the best things about living in Ho Chi Minh City. This was originally published on the LanguageCorps Asia blog in May 2014. My writing style has since changed but I still wanted to share this on my personal blog since it is no longer on the LanguageCorps website. I’ve written many different things in the past and now that I have a committed blog, I’m making an effort to dig up my favorites and post them here. I’ve edited the article below so that unfamiliar audiences can also enjoy it. Thanks for reading! Introduction: My name is Riri and I’m from New York City. I graduated in 2011 with a Liberal Arts degree from Soka University of America in Aliso Viejo, California. I started the LanguageCorps TESOL training program in October 2012 and have been teaching in Ho Chi Minh City since. I have two jobs: I teach learners of all ages at a language center and also elementary school students at the Japanese School. A year and a half has gone by, and there hasn’t been a day without surprises. Here are ten reasons why you should join LanguageCorps and teach in Vietnam. This lady is a boss. She runs the program here and is everybody’s godmother. She knows how to get things done when you face challenges. It’s incredible how she has a solution for everything. She also has the sassiest sense of humor. I jokingly once said, “Hey Hien, I like Vietnam, but I will move to Malaysia because I love it more!” She replied with, “You can, but you won’t have H-I-E-N, so there is no point.” She’s absolutely right. You’ll start in Phnom Penh, travel to Siem Reap for a weekend, and then to Sihanoukville the next. That’s already some amazing traveling that you’ll be doing. Wait until you get to Vietnam. Traveling gets better because it’s easy to go anywhere. I have traveled to Malaysia five times (yes, I love it that much), Thailand and the Philippines once, motorbiked to the Mekong Delta, returned to Cambodia three times, and spent a new year in Indonesia. I’m not stopping there. The LanguageCorps network in Ho Chi Minh City is tight, so you’ll make friends very quickly. These people will become your colleagues, roommates, party mates, travel buddies and before you know it, you might even find yourself in a relationship. It’s already an immersive cultural experience living around Vietnamese people, but you’ll also meet expats from all over the world, giving you a global network. Everyone is willing to share tips on living here and help each other out. You’ll never be alone. Another network perk? Abundant job opportunities. If you’re anything like me, you’re worried about managing personal finances. It might take a few months to settle in, but once you’ve worked up enough hours, you’ll be able to live comfortably. It’s possible to put aside a substantial amount for those student loans, travel plans and your next career move. If you don’t have any debt back home, lucky you. Go celebrate. On average, most people teach for twenty-five hours a week. That gives you a lot of free time to do what you are interested in, and the possibilities here are infinite. You could have movie marathons at home or go eat at every restaurant on your block. Maybe you’ll road trip somewhere or go outside the country. As long as you are responsible and professional, most schools will work with your desired schedule. You won’t be chained to the 9 to 5 weekday business if you prefer that, too. I love noodle soups. I love that they are the core of Vietnam’s local food culture. You can try something new every day and still have not tasted everything this country has to offer. Pho is great, but there are many other underrated dishes that you have to try. Another thing that I love is how easy and cheap it is to eat vegetables, especially those greens! There is a restaurant I go where you can wrap your own fresh spring rolls and they give you a giant garden full of leaves. I couldn’t be happier. Vietnamese food is great, but you might start craving something else. Don’t worry, though. 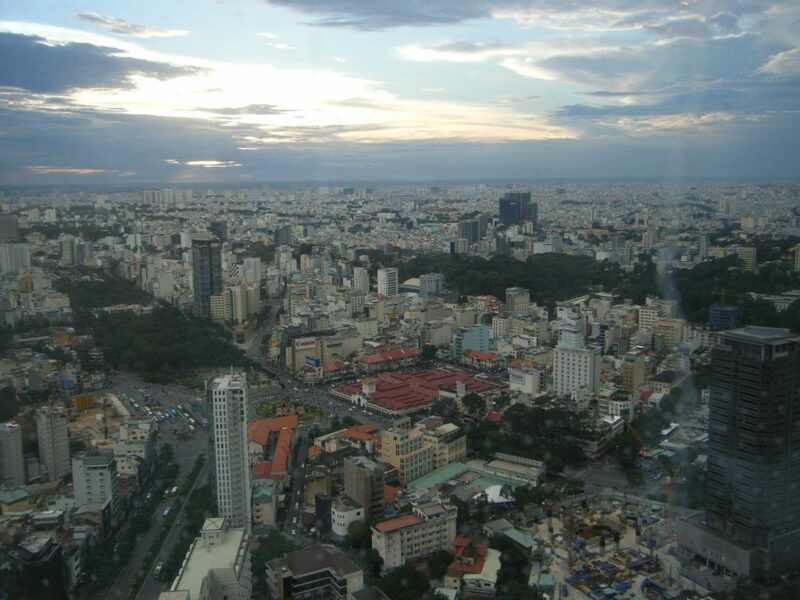 Ho Chi Minh City has almost everything, from Korean and Japanese to Mexican and French. The list goes on. The only thing that this city doesn’t have is Peruvian, and I could use some ceviche and lomo saltado. Otherwise, they have the international food culture covered. The best part? It doesn’t cost a fortune. I’m discouraged when I try to pick up Vietnamese because pronunciation is difficult and unforgiving. I tried to order a pineapple smoothie, but apparently I said shrimp smoothie instead. It’s these moments that make me empathize with English learning students. It’s a great chance to learn a new, language but being immersed it in keeps you, as a teacher, in the learner’s shoes. You’ll always have a reminder to be the kind of teacher that can instill confidence in your students and make learning engaging. Plus, once you work past that pronunciation barrier, learning and speaking Vietnamese is actually a lot of fun. You get paid to play games, sing, and watch your students blossom into capable, English-speaking individuals. Is that not rewarding enough? I am assuming most of you don’t want to teach forever, and that’s okay. But the great thing about working here is that you will develop relevant skills that you can carry over into your next career. This experience will teach you to write well, communicate effectively, and perform under pressure, empathize with your audience, among other things. However, it’s up to you to learn how to market these skills and present them attractively on your resume. There’s no doubt that you’ll have a great time teaching and living here, which is why you should join LanguageCorps. You’ll hit tough spots, but if you learn to face them as growth opportunities, you’ll make the most of your endeavors here. So, what are you waiting for?